Losing a tooth as a child is a monumental and exciting event. However, for most adults, losing a tooth is not something they wish to do. Permanent teeth are meant to last forever, and the thought of losing a tooth (or multiple teeth) can be very upsetting. At Gold Hill Dentistry in Fort Mill, SC, we perform a full range of dental care in order for our patients to receive a confident and full-functioning smile. For some, this includes a tooth extraction, and we provide excellent care before, during and after. There are many reasons that a tooth may need to be extracted. 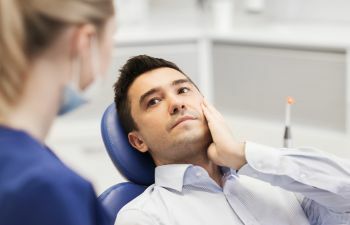 One of the most common reasons is that wisdom teeth have developed at the back of the mouth and need to be removed in order to prevent shifting of the other teeth. Another common reason for a tooth to be extracted is that it has become damaged or has started to decay. A damaged or decaying tooth that is not extracted can lead to many serious oral health issues, and therefore should be extracted to prevent further tooth loss. At Gold Hill Dentistry, Dr. Kavi Sagunarthy and Dr. Jennifer Mokris deliver painless tooth extractions to patients in Fort Mill and the surrounding areas. Our office is equipped with the latest in dental technology and relaxing amenities in order to provide our patients with a positive experience. We accept most dental insurance plans, and we are currently welcoming new patients into our practice. Gold Hill Dentistry wants to be your trusted source for your comprehensive dental needs, and if you are in need of a tooth extraction you can trust our high quality dental care.